Sir Nathaniel Curzon, 5th Baronet (1726-1804) succeeded his father in November 1758 already with plans to rebuild the family seat at Kedleston Hall. He had served as MP (Tory) for Clitheroe (1748-54), and Derbyshire (1754-61), was created 1st Baron Scarsdale on 9 April 1761, and served in the House of Lords (1775-90) as chairman of committees (1775-89). He made a brief visit to France, Belgium and Holland in 1749 but never undertook a Grand Tour. On 27 October 1750 he had married Lady Caroline Colyear (d.1812), daughter of the 2nd Earl of Portmore, and had five sons and two daughters. The Curzon family has lived at Kedleston since the twelfth century, in a variety of different houses. Curzon inherited - and later demolished - a red-brick Queen Anne house of c1700 which had been built by Francis Smith of Warwick (1672-1738). Curzon first consulted James Stuart (1713-88) in 1757, but was to employ Matthew Brettingham (1699-1769), and then James Paine (1717-89) to rebuild the house. By the end of 1760 these two architects had designed a house inspired by Palladio's Villa Mocenigo, with a central block, four quadrants and pavilions, and they had built the two northern pavilions and part of the central block. Landscaping the park had already begun under Curzon's father in 1756 by William Emes (1729-1803). Only a month after he had inherited, Curzon was introduced to Robert Adam - newly returned from the Grand Tour - by General Sir Charles Hay. Curzon consulted Adam about the designs made for Kedleston by Stuart and Brettingham and, unsurprisingly, Adam was deeply critical. Curzon immediately gave him responsibility for the landscape architecture and interior design, and by the end of April 1761 Adam had also been given control of the house. A formal agreement was made between Adam and Lord Scarsdale (as he had been for only a week), that the architect would receive 4% of the total expended, on the understanding that he made annual visits. During the time that Adam held the reins at Kedleston, Scarsdale also employed various artisans with whom Adam was familiar: Joseph Rose was responsible for the plasterwork, and William and John Linnell provided furniture for Kedleston from 1759 until John’s death in 1796. Scarsdale paid the Linnell firm a total of £2,922, though the household ledgers sadly do not specify the exact furniture and upholstery that was supplied. In addition, various items of plate were made by Diederich Nicolaus Anderson (d.1767), and several chimneypieces were carved by Michael Henry Spang (d.1762). Adam's design for the north front of the house was restricted by the previously constructed work of Brettingham and Paine, though alterations were made to the elevation of the central block. With the south front, however, he was able to be more creative, as Paine's projected design included an unrealistically costly domed and colonnaded rotunda. Inside Adam maintained Brettingham and Paine’s vision of a grandiose entrance hall - which Stillman described as Adam's 'most architectonic room' - though this was not actually executed under Adam owing to financial considerations. George Richardson (c1738-c1813), a former draughtsman from the Adam office, was employed by Scarsdale in the 1770s to complete the interior, and his drawings for the hall ceiling remain at the house. Adam's designs for the principal apartment (library, dining room and music room), and the state apartment (boudoir, state bed room and dining room) were executed, albeit with a change of layout to the state apartment dictated by Scarsdale. Unfortunately, however, Adam's intended southern pavilions were not executed, even when he altered his design in 1768 to reduce them to small, square, one-room additions. Harris rather beautifully describes these rooms as 'Adamissimo'. Adam had the intention of publishing his designs for Kedleston, as Brettingham had done for Holkham Hall, but the project was lengthy and this never came to fruition. After Richardson's work few major alterations were made at Kedleston, one being the installation of central heating in 1912. As such, the Adam interior is largely preserved and the house is now in the possession of the National Trust. Both Paine and Adam's plans for Kedleston are included in Bolton's chapter on the house (Volume I, p. 230). As well as the engravings of Adam's designs for Kedleston in Woolfe and Gandon's fourth volume of Vitruvius Britannicus (1767, pls 45-49), there is a considerable collection of Adam drawings for Kedleston belonging to the National Trust and held at Kedleston Hall itself. These are currently (2011) being catalogued by Danielle Westerhof for the Trust's new database. 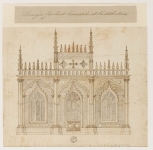 In addition there are three preliminary designs and two finished drawings in the hand of John Linnell for the sofas for the drawing room held at the V&A (E.119; 124; 129; 131; 140-1929). I am grateful to Dr Michael Snodin for his advice on drawings for plate, and to Simon McCormack, House and Collections Manager, Kedleston Hall.